Yet another Kickstarter Cinderella story, developer Pyrodactyl Games initially required about $3000 to fund their project. When all was said and done, the independent firm headed by Arvind Yadav had managed to gather over $36,000—an astonishing 1208% of their original request. And with all that support that the project garnered, the end product can be described exactly as billed—unconventional. In Unrest, you play as several characters in Bhimri, a city-state on the verge of collapse due to several years of drought and famine. Because of the lack of monsoons, a food shortage has forced the royal family into a trade agreement with the Naga Empire, whose denizens are an (unsurprisingly) reptilian race with a radically different social structure. Whereas in Bhimri there is a rigid caste system reminiscent of Ancient India, the Naga Empire has a completely open social structure, where competition for prosperity has driven some of their kind into the slums of Bhimri, creating massive racial tension between the humans, who are already struggling to find provisions, and the Naga, who require an even greater amount of sustenance to survive. Amid the troubling circumstances, the royal family is assassinated just after the signing of the trade agreement, and cunning, sinister individuals rise to fill the power-vacuum. In a more traditional game, you might play as a hero touched by destiny, come to fulfill prophecy and bring peace between Bhimri and the Naga Empire. This is not the case in Unrest. Instead, you control several ordinary citizens struggling with the day-to-day existence in a dysfunctional society. 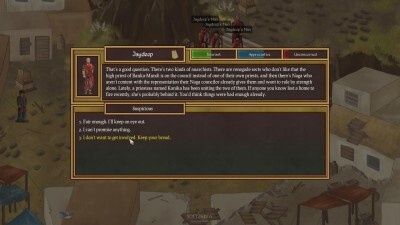 Over the course of several “chapters,” you play as a Naga ambassador, a peasant girl being forced into an arranged marriage, a former princess driven into the slums to fight for survival, a priest in the service of a shady religious organization, and a mercenary captain doing his best to keep the peace. The game leans extremely heavily on its story, which is a good thing, as the combat in the game is virtually non-existent. In fact, on my first playthrough of the game I did not enter combat a single time. It took my second playthrough of the game, when I deliberately went out of my way to pick fights, that I finally managed to get into a combat situation. The story, however, is as meaningful as it is intricate. With each new character and section of city unlocked for exploration, you are faced with a large variety of people in different situations that call for action on your part. The actions you take may be self-serving or selfless, cautious or reckless, but always have consequences, sometimes incredibly dire. For example, I quickly had the wind taken out of me when—in the first portion of the game—I made several decisions that ultimately led to the untimely death of my character. Beyond simple survival, the cause-and-effect nature of the game also makes for some impressive moral dilemmas. You may be forced to choose between using some acquired gold to help feed a group of Naga living amongst the game’s equivalent of the Untouchables in the slums, or paying off a guard to help protect your family in case the worst happens. The dialogue is believable enough that you, as a player, become invested in the lives of the characters you control, and you really do begin to feel the weight of the decisions they are being forced into. Unfortunately, the beautiful and moving story, along with its believable character conflicts, are buried under a mountain of flaws. The most glaringly obvious fault I found with the game was in its aesthetic. Now, I would normally never fault an independently developed game for having poor graphics, but if I am being completely honest, Unrest looks like a bad Flash game. That being said, I could appreciate the hand-drawn art used for every asset in the game, from the characters down to the environment—except that the drawings don’t fit the tone of the game at all. The color palettes used are incredibly vibrant, which is not befitting of a game with such a dark setting, and the environment is pristine—even in the slums, where sickness and death await around every corner, there is something about the art style that just doesn’t give the impression that the city is in such a desperate state. The music in the game does give a much more appropriate sort of tension with an Indian flare, but does not make immersion much easier, especially since the loop that it runs on is generally quite short with a rather obvious break. The mediocre art design also trickles down into the gameplay. There are several ways to control your character, including the standard WASD and arrow key configurations, as well as a “click-to-move” system, but the poor pathfinding (as well as the layout of the city itself) can make it difficult to move from place to place. And while the conversation itself is actually very engaging, the system in which it occurs is quite the opposite. The dialogue screen flashes every time an option is selected, which is just enough to be annoying to the point of frustration. 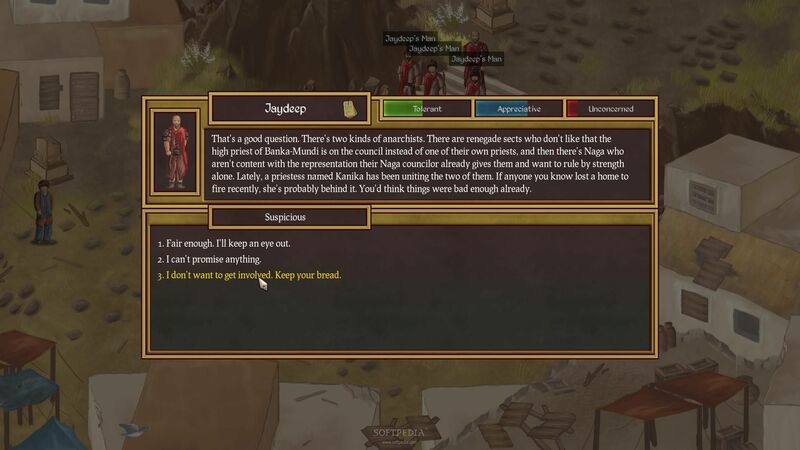 The conversation system implemented in the game, while unique, ultimately feels pointless. The Kickstarter page for the game outlines the conversation system as follows: “Every person in the world will have their opinion of you – some might despise you simply because of your birth or caste, some might admire you if you are a priest of the religion they follow, or some may be indifferent to your fate. We measure all these possibilities using 3 values for every character – Friendship, Respect and Fear. This system enables the game to portray a number of nuanced relationships that are not fully conveyed with a single “opinion” value…” Unfortunately, this ambitious idea falls flat on its face. Because of the nature of the conversations you are having, where almost every dialogue option is a moral decision, it’s hard to care what a character thinks of you. The game would be better served, and would feel more natural, if the system was removed entirely for a more organic experience, as the rest of the game has that kind of feel. Less of a fault than a general curiosity, Unrest was billed to be set in a “fantasy reimagination of Ancient India,” but in retrospect, the only thing that gave the game a fantasy twist was the inclusion of the Naga. The reptilian creatures felt out of place because nothing else in the game gave off a fantasy vibe. In fact, the Naga could easily be replaced by a human empire and the core commentary of the game would remain intact. In the end, Unrest is a game that delivers a powerful story through a sub-par gaming experience. It is a story that may be better served being told in a television mini-series, where emotions can be better displayed and characters are more believable, than in the video game medium. 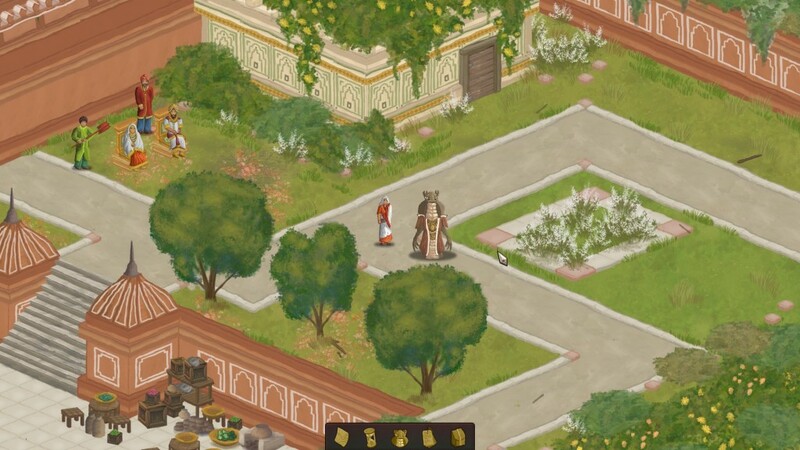 If you want to enjoy a unique storyline, with branching arcs, believable and unconventional characters, and strong cause-effect relationships, then Unrest may be worth a look; but if you’re easily distracted by poor visuals and gameplay mechanics, it would be best to stay away.